Casseroles are the glue that bring all kinds of ingredients together quickly and creatively in a fun way. 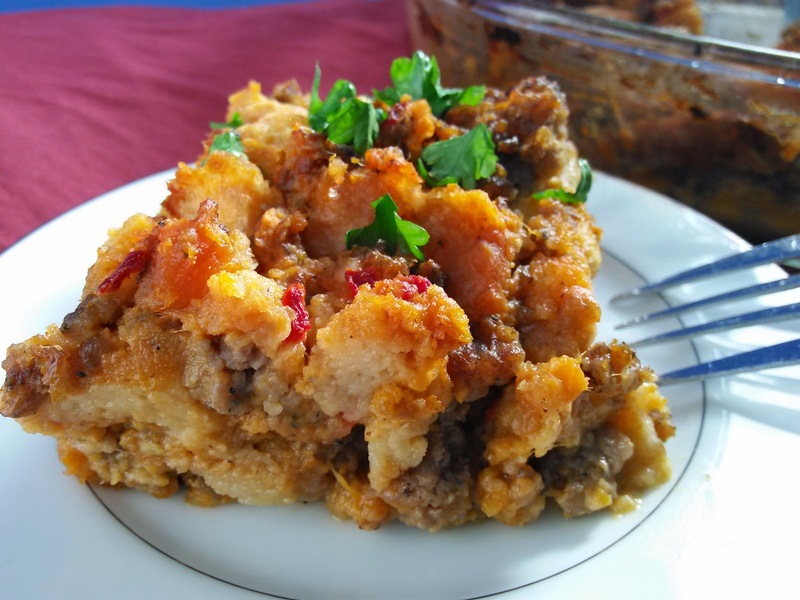 Some may argue that some casseroles probably contain glue, but in general everyone loves to throw a casserole together (be it macaroni and cheese, breakfast strata or Scandinavian Hot Dish) to take to a pot luck supper, put in the freezer or set up overnight for easy prep. Organized by Alice of A Mama, Baby & Shar-pei in the Kitchen, this week's #SundaySupper theme is Captivating Casseroles. Comforting, familiar and full of some great ideas for breakfast, lunch, dinner and everything in between, this time of year begs for something hot and comforting from the oven. There are even some desserts baked IN casseroles (the namesake of the cooking vessel and the culinary dish) to round out the nearly 40 bloggers showcasing their goods this week. So crank up your oven, pull out that bakeware and get cooking! 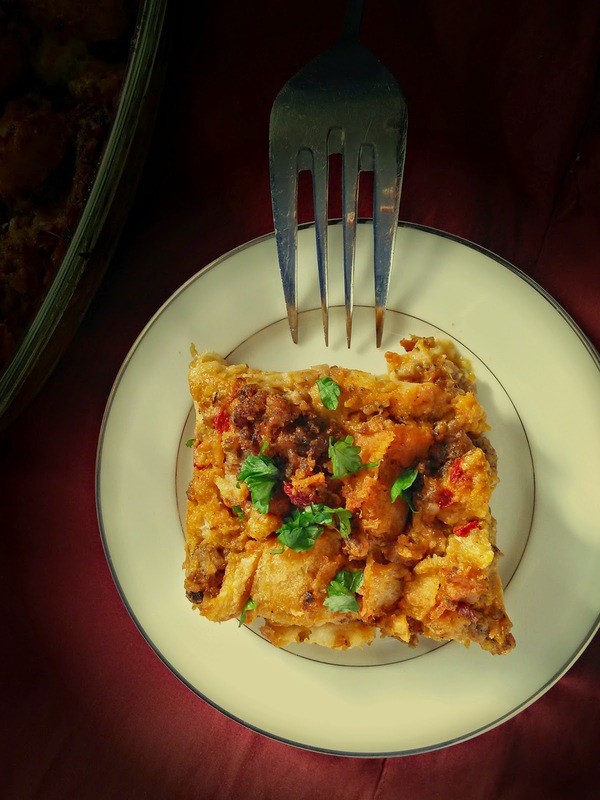 I'm sharing this new-to-me recipe for Sweet Potato And Sausage Bread Pudding. I was interviewed by a local magazine about what I was going to make for Thanksgiving in 2014. My family was invited to dine at a local restaurant so my oven was going to stay cold. The best part of Thanksgiving is the leftovers, so my plan was to make some items so we'd have something to eat over the holiday weekend. The result was this fancy, yet easy bread pudding! There's something about when your fork breaks through the buttery, crusty top layer of bread and hits the soft, creamy interior of pudding that makes you know that all is right with the world. Full of (five) day-old cubed bread, spicy bulk sausage, dried herbs, and bits of roasted red peppers, this bread pudding comes together with a smooth sweet potato custard and a little lovin' from the oven. I served it with roasted quail and a sprinkle of parsley, in lieu of powdered sugar or a caramel sauce like its dessert cousin. Typically, bread puddings are just thrown together and there isn't a recipe or any ratio to follow, but I carefully measured and tested this one for you so that you can recreate this new family favorite. Grease a 9 x 13-inch baking dish with olive oil. Add the bread cubes to the baking dish. Spread the cubes evenly in the prepared baking pan. Set aside. In a large sauté pan over medium-high heat, add the sausage and cook, breaking up the meat into small clumps. Add the sage and rosemary. Cook sausage until browned, about 10 minutes. Transfer the sausage to a large mixing bowl, discard the fat. In a medium mixing bowl, add sweet potatoes, roasted red peppers, milk, eggs, cinnamon, chili powder and maple syrup. Season with salt and pepper. Use a potato masher or a large serving fork to mash the mixture together until homogenous and the eggs and milk are incorporated throughout. Add the sausage mixture to the sweet potatoes. Pour this combined mixture over the bread cubes and mix to make sure each piece of bread is coated. Dot the top of the bread pudding with the cubes of butter. Bake for one hour, until puffed and golden brown. Let rest 10 minutes before serving. *Okay, you've read this far. You deserve a treat. I don't know if you know or not, but one of my 2015 goals is to take better blog photos and it's only the 11th day--did you see my pics? They're gorgeous! I think I did a bang up job this time around! Best bread pudding I've seen in a long time. I love that it is savory. Sweet potatoes and sausage - to of my favorite things! LOVE savory bread pudding. Great recipe. "Some casseroles have glue!" You crack me up. I'm loving all the flavors in this bread pudding especially the savory touches!! I LOVE sweet bread puddings, but I've actually never had a savory one. What a creative idea, of course i'd have to omit or replace the sausage with something but the sweet potato is staying put! Yum! What I great idea! The photos look fab as well. Yummy...can't wait to make this for our brunch one weekend very soon!!! I love making sweet potatoes savory. I'm fond of all that sugar and cinnamon on roasted sweet potatoes, so this is RIGHT UP MY ALLEY! YUM! This looks so delicious and I think it would be a great addition to the holiday table as well! Filing and keeping!!! I adore a savory bread pudding and this one has my favorite ingredients! 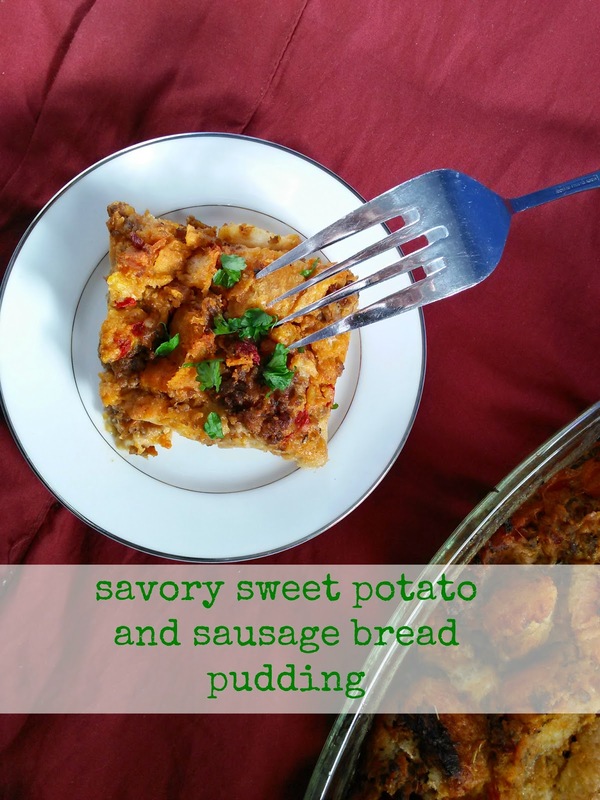 Sweet potatoes and sausage are an incredible combination...this looks SO delicious! This sounds amazing! I love the sweet and savory combo! This is my kind of meal, Nikki! It was delicious! Hubby said it tasted like a fancy bed & breakfast breakfast. Very easy, too. I used sweet potatoes from the farmers' market - braised them and then cooked them down with the cayenne, cinnamon and syrup. I added fried sage leaves on top. Thanks! Oh goodness, yes. Yes to all of that! Love a savory bread pudding. I love all the flavors in this! It looks amazing! Now that's a bread pudding I'd like to sink my fork into! I'm with everyone else who has already commented - this IS SERIOUSLY one of the best bread pudding recipes EVER! 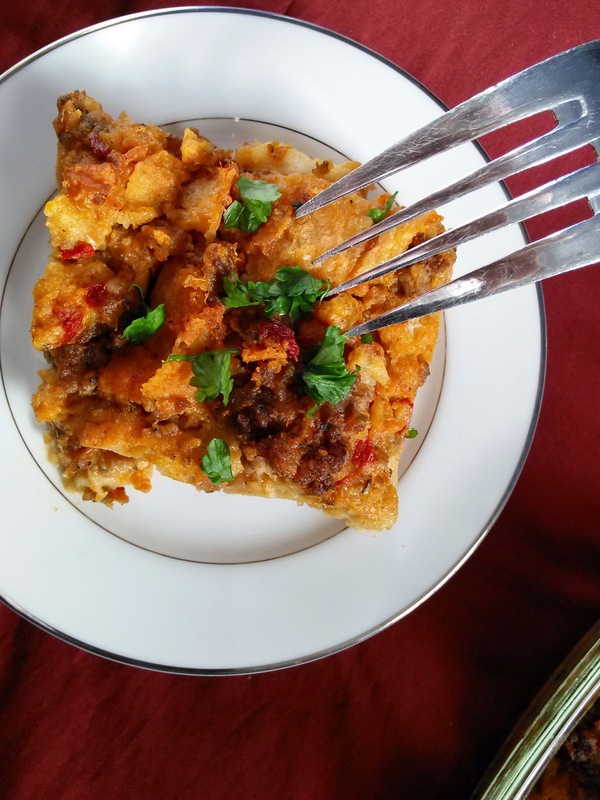 I love the idea of a savory bread pudding instead of a sweet one! So amazing! Now that is one creative and damn delicious bread puddin'!! LOVE LOVE LOVE! How I love a good bread pudding! Sweet, savory - I'll take it either way. But with sweet potato and sausage, this one has me salivating right now. I've never had a savory bread pudding. I've only made sweet ones before! this is great!! Sweet potatoes and sausage are so good together. I love this casserole! I love to make bread pudding! However I had to read your title TWICE! I have never laid eyes on a savory bread pudding...Brilliant! Love the flavors happening here! I can see this bread pudding in my future. Loving everything about this and is it bad that I want to top it with a fried egg and have it for breakfast? You just can't beat a savory bread pudding! I bet the sweet potato custard is nicely tempered by the spicy sausage. This one is a keeper!